vii, 36 p. : ; 23 cm. 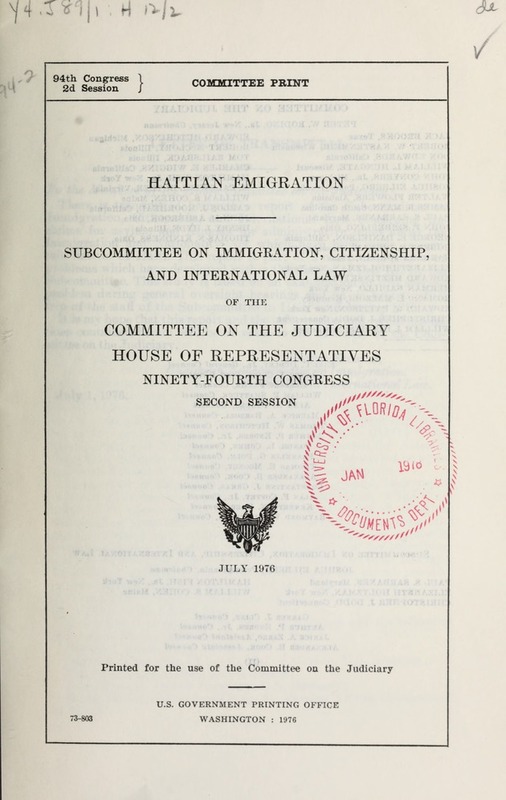 Subcommittee on Immigration, Citizenship, and International Law of the Committee on the Judiciary, House of Representatives, Ninety-fourth Congress, second session. trip of the staff of the Subcommittee to Haiti in February 1976.
cution on account of race, religion or political opinion). and adjudicating the claims which have been made by these Haitians. from Haiti to the United States. Matthew Heim, Catholic Relief Service. with a Haitian was observed. for their implementation were reviewed in detail. various aspects of this problem. be persecuted if returned to their native country. view of their deportation order and it was likewise unsuccessful. such cases have come to the attention of INS and, according to INS. prior to their arrival in the United States. many thousand of other aliens who come to this country illegally. volved in this litigation have raised the issue of a claim to asylum. upon the alien applying for this administrative relief. Iv)isions of international law on the subject. these two claims are sometimes adjudicated in a consecutive fashion. to satisfy and that general statements will not suffie. of the government currently in power in the alien's native country. adjudicated individually based on all of the facts in the case. suance of a decision reached in accordance with due process of law." his life or freedom would be threatened on accomt of his race. religion. her 1, 1968 wi(h11 incol'l)orate( Articles '2 tlrouh 35 of the Conventionl. rotocol Relating to t he St at us of Refuree. which may be favorable to the asylum applicant. the Convention and Protocol Relating to the Status of Refugees. exclusion proceedings are conducted before a special inquiry officer. Creole language, as soon as possible after his apprehension. the, completed form which is then signed by the applicant. permitted upon the Haitian's request. aimner in the Travel Control Section (in the Miami District Office). oInmon; and (3) denial of the application for lack of substance. desires to apply for asylum. tor or Border Patrol agent. right to counsel; not, however, the availability of counsel. Travel Control Section and the procedures followed are identical. favorable to the asylum claimant. Form I-5S9, a transcript of the interview I with the asylum claimant. zntcIl-ir whIth was the usual preedure. any memoranda which have been prepared. contained in the caim for asylum. of Haiti to observe the debriefing of these returnees. ,ernment in Ilaiti-facts which are relevant to the asylum claim. 11nN volmtary agencies which have offered assistance. 1iin(lerstan(lirg and documenting his asylum claim. reconcile soie of these statements. t ion of these claims. and forthright statement on the part of the claimant. desirable to have specialized individuals conducting the interviews. officers depending on whether it is an exclusion or deportation case. This practice should be terminated. rise to a "well-founded fear of persecution." the Department of State in the event it is a category II or III case. Office should approach the State I)epartment for an advisory opinion. the types of cases which have been favorably decided. In addition. there is no systematic review of asylum denials by the centrall Office. denials alld the District 1)irectors appear to operate autonomously. priate designee in the INS Central Office. tion with the State Department. ('osequecn.1,es that may flow from an erroneous decision. socioeconomic status of the applicant. are responsible for this phenomenon. alotric ii;ike is the second lowest in the world, lower than even Bangladesh. th;1 t ill n11.v ca- there is less than an acre for a family farm. mill ion for fiscal year 191G. ttis subjct in various Committee reports. Iliastery over the lives of the Haitians. reduced t hi figure in recent years. tiniel violatiI of hfm an rights in Hbiti. by an unflinching willingness to suppress PeoilIe has not. froti a uthorit arian rule." for the arge scale, illegal emigration flon oaiti to the UJnit(l States. of the civil liberties of Haitians. means to survive", that this is a form of "political oppression". While it is difficult to distinguish or categorize the various "push"
factors that lead to a decision to emigrate, it is quite clear that U.S.
would include most persons in developing countries around the world. whether such person is a political refugee. cution, it is the motivation behind the persecution that is important. rectly to or be based on his race, religion, or political opinion. punishment on return was political in nature. Many uf the ttaitian exiles, however, are more "economic" than "political"
exiles seeking permanent residence in the United States. his proofs, for the stakes are high." \\a unable "'to convey the full basis of his fear of persecution." tions; prior political activities and prior convictions for "political"
11Y w who pIst() 1o oflicial authority). ing no foundation in fact. vided for the full and fair presentation of their claims. tunity to fully present their claims. ing procedures to preclude such dilatory tactics. advisory opinions to INS on a particular case. judicial review of their cases. Relating to the Status of Refugees. form procedures should be established for both types of proceedings. natives of countries of the Western Hemisphere. vidual within the Central Office. information within the Central Office and to the various district offices. to substantiate allegations that are made during the interview. pr-ovided to accomplish this objective. that Embassy in order to process these cases. relief and who have been returned to Haiti. of asylums and 243 (h) cases. detailed briefings to accomplish this objective. bassy has been contacted for an advisory opinion. plicable laws and other factors. freedom and humanitarian concern for the treatment of the individual. for its implementation within areas subject to jurisdiction of the United States. of the U.S. Government, under the coordination of the Department of State. Updated January 10, 1973 to conform with the Foreign Affairs 1Manual. priate offices in the Department of State and will maintain contact with the U.S.
assumes charge of the case. 1. Name and nationality of the individual seeking asylum. 2. Date, place of birth, and occupation. 3. D ,escrption of any documentation in the individual's possession. 4. What foreign authorities are aware that the individual is seeking asylum. 5. Circumstances surrounding the request for asylum. next intended port or airport. 7. Reason for claiming asylum. government office now held or previously occupied. State summarizing all available information. with a response that the case has been referred to headquarters for instructions. tions within the territorial jurisdiction of a foreign state, any requests for U.S.
asyln should he reported in accordance vith the procedures set forth herein. is put in danger, such as pursuit by a mob. U.S. official present at the scene, -taking into consideration the safety of U.S.
except that authority to do so shall be obtained from the Department of State. Where a military installation not under direct Embassy jurisdiction is involved. has been referred to Washington. Upon receipt of a request for U.S. asylum made by any foreign national. T.S. personnel within foreign jurisdiction should noitfy immediately the nearest ,. S.
munications systems with direct contact with their headquarters in the U.S.
the initial report should not be delayed pending its development"
2. )ate, place of birth, and occupation. 3. l)escription- of any documentation in the individual's pssession. any government ofic-e now held or previously occupied. will be accorded due process of law. (b) There is no evidence of danger of forcible repatriation. ti.alde of the request for asylum. l-p, ,litical, economic and social rights within asylum countries. re 'set tlemeint considered most suitable. A 'TitIrrWY : Sec. 103 ; : Stat. 17: (S U.S.C. 1103. $tI:,IE 39 Ft 41832, Dec. 1974, unless otherwise ot1d. chilren under the age of IX years may Ibe included in the application. of the Convention Relating to the Status of Refugees. tious decision the district director determines that the Form should be waived. checks shall be conducted, if deemed appropriate. be sent to the Office of Refugee and Migration Affairs for its consideration. Refugee and Migration Affairs have been received. enforce departure may be taken immediately. slall be paroled or reparoled in increments of a year with permission to work. in the case shall be held in abeyance pending decision on the asylum request. \ivws oif the eI )cartment of State and furnish ii-tructions to the reporting office. a crewman ,r stowaway, shall ie interviewed as set forth in (M 108.1(a). action on the request has been completed. remedy may be available to the subject. tion over your place of address. it, Are u sti tlsiiit Ii any ite, itty? :-1. 09,tr Rti*t1V*S 44 U.S.
17. I you return to your country, for what specific reasons do you believe you will be persecuted?. 18. Have you or any member of your family ever been detained, interrogated, arrested, convicted and sentenced, or imprisoned because of the above? 19. Why in your opinion were the actions cited in Item 18 above taicen against you? 20, Did you belong to any organizations) which were considered hostile to the interests of your Home Country? Government? M- Yes M No If "Yes", explain. 21 P-. yOur requ.est ftor 4tylur becomrn kc ,wn t.. the authorities of your Home Country? 27. Ilave you e*N i le j 1- fo a)m in any other' country' ) s No) It -Vt ", explorer what happen d.
El No If "Yes", explain. 30. 1 do swear (affirm) that I know the contents of this application signed by me and that the statements herein are true and correct. from the point of arrival to our District Office in Miami. tnakes concerning persecution or I)ssible persecution in Haiti. detained in lieu of a $50) bond. of the three documents in his presence. (leciding the merits of the request; (3) to deny the request for lack of substance. cluding the typed transcript of the asylum interview. meantime we receive (onfirmation of our decision from ti State Department. review our decision, and, if he(e.ssa ry, recoin mend reversal. iii;y appeal that decision to the United States Court of Appeals. to Border Patrol Hleadquarters for processing. to legal representation (Form 1-214). he wishes to request asylum. that the District Director issue an Order to Show Cause and a Warrant of Arrest. makes concerning persecution or possible persecution in Haiti. each of the three documents in his presence. the asylum applicant at the same time that we inform the State Department. meantime we receive confirmation of our decision from the State Department. view our decision and, if necessary, recommend reversal. to stay deportation because of possible persecution in Haiti. have granted withholding of deportation to five Haitians in the past three years. They live denied hundreds of other applications under the same Section. Appeals under Section 146 ( a). Sovetskaya Litva to CGC Viilant. affirming there has been no change in U.S.
of requests for political asylum. travel documents effective June 1, 1973.
sued clarifying regulations on asylum. 34 inclusive of the Convention to refugees as hereinafter defined. such events", in article 1A (2) were omitted. of the provisions of the present Protocol. to ensure the application of the present Protocol. of the parties to the dispute. may have been addressed by the General Assembly of the United Nations. opf the Convention to be applied ill accordance with article I, paragraph 1.
that provision by legislative or other action. shall not extend t,) refugees in respect of whom the Convention applies. obligations under the present Irotocol. effect addressed to the Secretary General of the United Nations. mutandi to the present Protoc.l. State of its instrument of accession. tion addressed to the Seretary-General of the United Nations. of decla rations and notifications relating hereto. this thirty-first day of January one thousand nine hundred and sixtyseven. save on grounds of national security or public order. of a particular social group or political opinion. Commis-siner, Immigration and Naturalization Ser'ice, Washington, D.C.
Immigration Service since the apprehension on these Haitians. I would certainly appreciate a prompt response to this request. Washington, D.C., June 29, 1976. Committee on the Jiidici#ry, Houie of fepresenfatives, Washington, D.C.
some of the information contained in our referenced report. Ietitlons filed in their behalf are being processed, and 42 have absconded. noted. Since the early part of this year there have been 6 grants of asylum. Washington, D.C., April 7, 1976. Committee on thc Judiciary, H110se of Representatives, Wazinton, D.C.
claim they will be subject to persecuion if returned to Haiti. attempted to keep abreast of all developments relating to the Haitian situation. prehensive report to the Committee in the near future. relating to asylum are adhered to by the Execuive Branch. Washington, D.C., September 16, 1974.
records indicate that 1024 of these Haitians are presently in the United States. Only those Haitians who are believed likely to abscond are being detained. detention. None are women or children. Refugee and Migration Affairs, Department of State. At the present time there are 35 Haitians in asylum status in the United States. One hundred fifty-eight (158) applications for political asylum are pending. of January 31, 1967 to which the United States is signatory. United States District Court, Southern District of Florida, under Sec. 10( b). others joined at request of counsel, number 250. To date 19 Haitians have been deported. Others have departed voluntarily. Haitian Government. Other cases are being checked by Embassy officials. Washington, D.C., June 12, 197. Hon. PETR W,. RomIo. Jr..
in a particular social group will be permitted to remain in the United States. numbers and status of cases.